Client: President's Choice Financial Studio: Perennial Inc. Illustrated Hi-res typography in snow, Illustrated the background for the PC MasterCard. 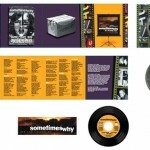 Client: Sometimeswhy Studio: Intwine Design CD package layout and design using photography supplied by client, Sticker design. 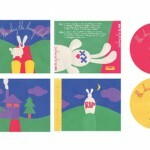 Client: The Day The Bunny Died Studio: intwine design CD package layout and design, Illustration created using contruction paper, hand rendered typography.